Kill the giant frostbite spider blocking access to Nchuand-Zel. Talk to Calcelmo in Understone Keep. 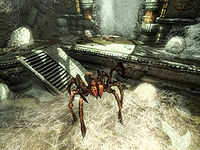 Kill Nimhe, a giant frostbite spider. Calcelmo, an accomplished scholar and author, is the owner and curator of the private Dwemer museum and the associated Nchuand-Zel archaeological dig site. Should you wish to enter either of these locales, you must go through Calcelmo. He spends his time at the arcane enchanter set up across the underground river from the entrance to the Nchuand-Zel excavation site. Talk to him about his work, and he will inform you that he has been placed in charge of curating artifacts extracted from Nchuand-Zel, an ancient Dwemer castle located deep within the mountain behind Understone Keep. He mentions his excavation efforts being thwarted by the presence of Nimhe, a giant frostbite spider that is blocking the entrance to Nchuand-Zel. He asks you to kill the spider in exchange for access to both his Dwemer museum and the site itself. The entrance to the Nchuand-Zel excavation site is a large metal door at the top of a short flight of stairs directly across the stone bridge from where Calcelmo's arcane enchanter is set up. Once inside, you will encounter a set of two square rooms connected to each other, with staircases on all sides of each room. All staircases are blocked by crumbled stone except the one at the far left, which provides access to the excavation site. After proceeding through a short passage, you will descend into an area which is still under excavation (mostly dirt and wooden scaffolding), and encounter two or three frostbite spiders. After killing these, you will proceed a little deeper into the excavation area, where you will come across a seemingly dead end, with webs on part of the wall. Look closely and you will see that some of the webbing is blocking a passage. Cut through the webs to provide access to the passage, which leads to a room with a raised stone walkway with stairs at the opposite end, covered with spider webs. If you look up, you will see the large webbed hole in the ceiling through which Nimhe will descend once you approach. Dispatching of Nimhe may prove difficult within the tight quarters, since there is very little room to maneuver in order to pull back from her attacks. An option is to retreat back down the corridor from which you came and attack Nimhe with ranged weapons or spells, as she cannot fit in the passage. Once the deed is done, search through more webbing at the top of the stone walkway to find the body of Alethius, and clues leading to another quest within Nchuand-Zel. Once you inform Calcelmo of the giant spider's demise he will award you the key to Nchuand-Zel as well as the Dwemer Museum key, allowing access at any time. Following the completion of this quest, the various Dwemer metal parts on the two tables near Calcelmo and his nephew may now be taken without consequence. Despite access to Nchuand-Zel being promised by Calcelmo as a reward for this quest, the area may be accessed, and thus Nimhe encountered, beforehand by picking the lock on the excavation site door. You can access Nchuand-Zel without killing Nimhe, but this may prove rather difficult, as her large body blocks a good deal of the rather small antechamber preceding the entrance. Nimhe may respawn upon returning to the Nchuand-Zel Excavation Site after a long enough period of time. On the PC, it is possible to use the console to advance through the quest by entering setstage FreeformMarkarthO stage, where stage is the number of the stage you wish to complete. It is not possible to un-complete (i.e. go back) quest stages, but it is possible to clear all stages of the quest using resetquest FreeformMarkarthO. This page was last modified on 31 March 2018, at 10:12.